Hello and happy Friday everyone! Similar to last weekend, we don't have a whole lot going on this weekend which really makes me happy. We do have a few errands to run for someone's 2nd birthday next Saturday. Seriously, how does this little girl get so big so fast?! I'm linking up to share some of the favorite things I'm enjoying this week. You're welcome to link up as well and share what you're loving in the comments below! 1. Pretty Little Things. I picked up this beautiful gold box at Michael's the other day but I wasn't sure how to display it. Since I've been a part of the Organization challenge from A Bowl Of Lemons, it's been such a delight to go through old things and de clutter them. This box just itched for me to use it for some favorite Essie polishes I've bought. 2. Ellie. I can't believe this cat has been with us for almost 7 years! Time really does fly with her and I love that she always wants to be apart of what Lily and I are playing in her playroom. She just makes herself at home on Lily's toy table. She just wants to be with the girls. 3. Target. Some of you saw some of my Target finds yesterday on my Instagram. Seriously how does that store get better and better each time I go? I found these gems in the dollar section and it was as if they were begging me to take them home. I can't get enough! 4. Lattes. I love coffee and if you've been around my blog long enough you know I have a slight obsession with it. I tried these adorable lattes the other day at a coffee shop and loved the taste. It was a dark roast which usually can be too strong for me but this was the perfect touch after a long day. What are you enjoying this week? Any fun plans for the weekend? Those lattes look delicious! And I already told you my obsession with that notebook, it is seriously perfect! Too funny, I'm drinking a latte right now and just love them! Your kitty cat is just precious and YES,the Target bins are killing it lately! So many pretty valentine and springy things!! I hope you have a wonderful weekend gorgeous! Love your box of polishes - super cute! Target's paper products & dollar bin section have been seriously impressive lately! Happy Friday! Love the box with the polishes, and those Target finds are fabulous! Your cat is adorable! She reminds me of our cat who we miss dearly, ours looked similar to yours but was brown. 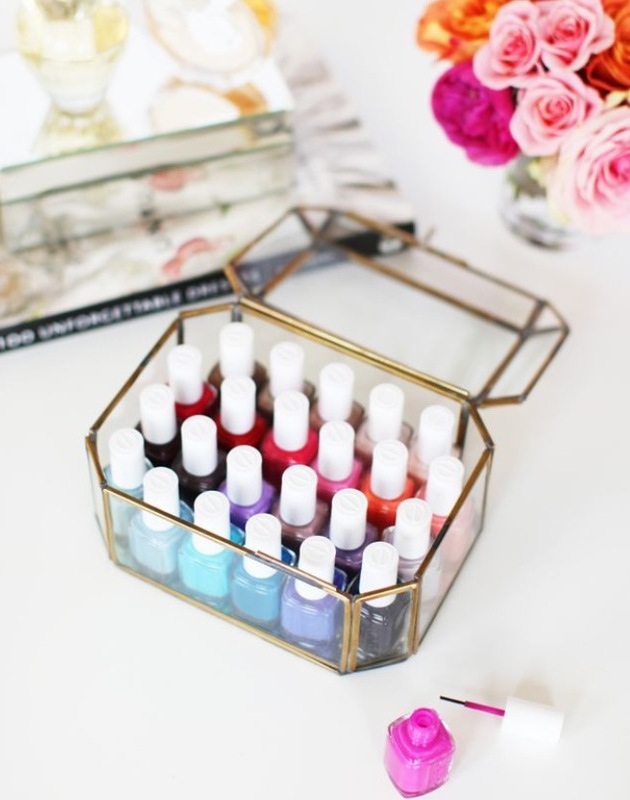 Also how adorable do those polishes look in that little Michael's box?! SO cute! There's something therapeutic about going into Target and buying something special for yourself. Even if it's from the dollar bins! Great post! Your pics are sooo cute! That gold box to hold your Essie polishes is.. Well. Golden. They look like little jewels in there! That coffee looks amazing! Linking from Friday faves! That gold box full of polishes is amazing!! And now I feel the need for a latte!! ha! Oh Target Dollar spot...I has seriously had to just stay out of Target lately because I can't control myself. After my Target bill came from my December purchases I was like oh snap! The polishes look great in that box. Love the idea. Is there really a such thing as too much coffee? I don't think so :) And Target...give me everything from there!! Especially some nail polish ;) Hope you had a great weekend! Oh my goodnes! I think I love all of your favorites this week! I have had my hands on that container from Michaels a few times, but I always end up putting it down because I couldn't decided what to put in it... The Essie polish is perfect! Hope you had a great weekend!